While I agree all are important, I feel the most important factor in good PBL is a great driving question. If you find the right questions then most of the other factors identified are covered automatically. 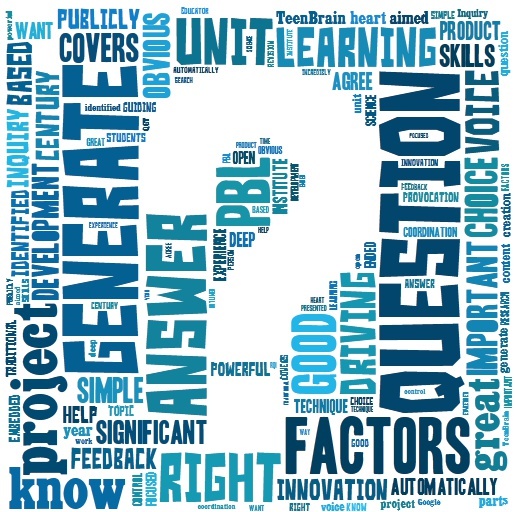 How do you generate a great question and who is the right person to generate that question? The answer to who should generate the question to me is obvious? If you want students to have a voice and to have choice as well as developing a need to know about some area of content, then they should be generating their own questions. How do we help students generate a question they care about and that covers the content we as educator would like them to learn in a deep and meaningful way? Here the answer has not always been so obvious but thanks to the work of the Right Question Institute(RQI) and their Question Formation Technique (QFT), the answer is incredibly simple and yet powerful at the same time. So far in my experience it has not failed to generate open-ended questions that cannot be answered by a simple Google search. Outlined here is how question generation was embedded at the heart of a PBL unit. TeenBrain is a science unit aimed at year 9 students that focused on the content of the traditional control and coordination topic. The unit was divided into four parts; provocation, guiding question development, research and project creation. The provocation was a series of short videos demonstrating how the teen brain develops from the age of approximately 12 to 25, and how the research presented explains why teenagers often make decisions without fully accounting for risk and long-term consequences. The majority of time during this unit was spent on the research and creation of an information campaign, based on a student generated guiding question. The most important part of the process in my mind was the generation of a meaningful guiding question. To do this we guided students through the Question Formation Technique from the RQI. The QFT process takes approximately one learning session and is best done in small collaborative groups. Questions generated for research were based on the provocation and a focus question why do teens make stupid choices? As the questions generated for this task were generated by the students themselves they found them intrinsically motivating. Examples of student generated questions include; why do our brains need sleep, is there a best diet for your brain, what can you do to improve memory/learning and how does marijuana effect you brain? Many of the ‘research’ tasks that formed the third part of this unit were traditional science lesson/experiences, that involved both student centred activities and some direct teaching of concepts, all supported by the on-line learning portal. At the end of every lesson students were ask to reflect on their own groups question and to add a couple of summary sentences relevant to their question in a shared google document. This document became students main resource when they came to designing and creating their information campaign. Students were instructed to use the information they had collected to produce an information campaign that would influence their peers to make better decisions. Their choice in presentation media was completely open, with some of the following offered as suggestions: a video, info-graphic, poster, magazine article, ios or android app, web-page, comic-strip. Students worked collaboratively on producing their final product and their focus was maintained by the intrinsic motivation produced from developing their own questions.